One very important point that I've been leading up to is this: If Moses is talking law, or if a prophet is talking law, or if David is talking law, or if Jesus is talking law... they are speaking either to those who are under the law and/or as those who are under the law themselves. Many of them didn't even understand at the time what was ultimately happening. So, what did this ultimately accomplish? It stopped the mouths of people and to showed them the guilt that they were under as long as they remained under the law. "Do not think that I came to destroy the Law or the Prophets. I did not come to destroy but to fulfill" (Matt 5:17). He then went on to say, "For assuredly, I say to you, till heaven and earth pass away, one jot or one tittle will by no means pass from the law till all is fulfilled" (Matt 5:18). And since Jesus went on to talk a lot of "law" talk, who was He talking to? Well, let's make one thing clear. He wasn't talking to Christians. There was not yet any such thing! One thing I think we seem to miss is that this is before the death and resurrection of Jesus. This was before anyone was ever born-again. This is before the New Covenant came into effect (through Jesus' death). Jesus' life on earth was still during Old Covenant times! He was born of a woman, born under law, to redeem those under the law. He taught the law and Old Covenant! Now, at times, Jesus did also speak New Covenant talk. Our challenge today is to rightly divide the Old from the New. 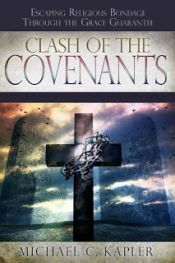 We must make a distinction between Old Covenant talk and New Covenant talk, whether we find it in the Old Testament writings or in the New Testament writings. So, if life in Christ isn't about "law," why did Jesus teach the law and the Old Covenant? Because the Law is the tutor that leads people to Him! (Gal 3:24-25). It's the law that stops every mouth from justifying itself and that puts all the world under the sentence of guilt... and that ultimately leads people to the Savior. You may say to me, "well, doesn't John 3:17 say that Jesus didn't come into the world to condemn the world, but to save it?" I heartily agree! In speaking the Law, Jesus was not Himself condemning people. The LAW itself condemned people, and Jesus simply taught the law (and again, He got to the very heart of the law) in order to stop the mouths of those who would justify themselves through the law. His law talk showed them how unrighteous they really were. Not to mention that all His law talk would be fulfilled by Himself! "I came not to destroy, but to fulfill," He said. Everything He said in the Sermon on the Mount, He fulfilled Himself. And so, as He spoke "law" to those who were under the law, He was doing more than one thing. He was fulfilling the law Himself and He was simultaneously sending a message to those who were under the law! What message? A mouth-stopping message! In fact, whether they would realize it or not the Law already made them guilty before God. Many people, perhaps feeling they've done a good enough job in keeping the law, do not understand this all, and I think Jesus often used to law to point out the reality of their guilt (to stop their mouths). I think the "certain lawyer" from Luke 10 and the "rich young ruler" from Luke 18 are wonderful examples of this. Scripture even reveals that in the Luke 10 case, the man was "wanting to justify himself." What do you do with someone who wants to justify himself before God? You dig deeper and deeper into the heart of the law until they finally "get" that they are guilty... and if needed you even leave them sad, as Jesus did with the rich young ruler.